“[This] is a self-portrait with a half-finished face, and the other half is sliced, showing the muscles, tendons and mucous membranes. It’s an anatomical analysis, which means that what is essential is not visible to the eye. Europeans, Africans and Asians are all equal under that which is so politicized – skin color. 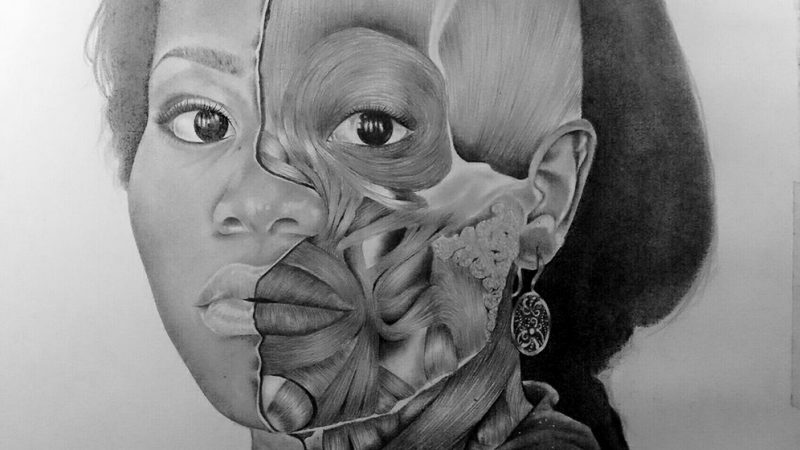 Above all, we are people, members of the same race, the human race.” Original drawing by Carmen Bolena, published by Afroféminas and used with permission. The following piece by journalist Lucía Mbomío was originally published on Afroféminas and is republished by Global Voices with permission. Carmen Mbasogo Edjang Ezuku is from Equatorial Guinea. She is only 22 years old and is captivatingly talented in many ways. She is a fine arts student, actress, singer and dancer. Yes, that’s a lot, but today we will “only” talk about her drawings. In her work, I see women who spoke to me, who looked me in the eyes, who burst out laughing and who touched me with their joy and strength. I have also seen a statement, a path, an identity. With Carmen Bolena, which is her stage name, the experience is a bit similar. Lucía Mbomío (LM): Is talent enough or does it need to be polished at school? LM: I have seen some of your drawings that look like photographs, so real, so detailed … and others in which you break with that faithful representation to convey ideas. For example, I'm thinking of one in which half the face is normal and the other is the flesh that all human beings have under their skin. Should art be more than beauty? Should it also be an ideology, transformative? CB: Gosh, this question shakes me to my core, hahaha. Let’s see, people love to ask those of us who have studied art (I have reservations about saying “artists”) what art is. Art itself is an abstract concept rather difficult to define because it is ever-changing. Its definition mutates and is linked to its given era. So, to the question “should art be more than beauty, ideological, transformative?” I will respond from a position of absolute subjectivity: It may be, but not necessarily. I am of those who think that art can make you feel without forcing you to think, but never leaves you indifferent. To me, art is a feeling and metamorphic beauty, because just as I see beauty in [Vermeer's] “Girl with a Pearl Earring ” or in [Van Gogh's] “Starry Night over the Rhône ,” I see beauty in Goya’s “Saturn Devouring His Son ” and in the works of Mark Ryden , Michael Hussar  or Edward Gorey . But, specifically, the drawing you mention does make an ideological statement: It is a self-portrait with a half-finished face, and the other half is sliced, showing the muscles, tendons and mucous membranes. It’s an anatomical analysis, which means that what is essential is not visible to the eye. Europeans, Africans and Asians are all equal under that which is so politicized – skin color. Above all, we are people, members of the same race, the human race. LM: And in what ways would you like to transform from this society? LM: Your work depicts many black women. Why is that? LM: How do you think being adopted affects your search for identity? Going to study in Madrid and meeting groups like Kwanzza  [the afro-descendant student community of the Complutense University of Madrid] and E.F.A.E [A collective devoted to ‘empowering afro-descendant females’ in Spain] was definitely a turning point. I saw that there were many more people like me, I was not alone and that there were many of us! Hahaha. It was fantastic to see that among us there were university students of politics, journalism, philology, art, science …. they spanned, we spanned every field. I began to read and to research, to go to conferences and interact socially and for the first time since I left Africa, I felt like I was part of something I identified with. Except for my status as adopted which, while true, you can count us on one hand.